What’s going on in Dongo? What is going on in Dongo, a small fishing village on the Ubangi river in the northern Equateur province? On October 30th, a gang from the Enyele community attacked Dongo and began hunting down members of the Monzaya community, along with other « outsiders. » They allegedly killed 47 people, including several dozen police who tried to intervene; some of these drowned in the river as they were trying to flee. We don’t know much about the motives of the Enyele. Everything allegedly started on October 29th, when youths gathered around an important shaman/witchdoctor called Udjani to carry out a ceremony to increase the yields on their fish ponds. Apparently there was a conflict between the Enyele and the Monzaya over these fish ponds, as well as over farm land nearby. After the ceremony, Udjani led the youths to Dongo, where they proceeded pillage and loot. Over 20,000 people fled Dongo and the surrounding areas to neighboring Brazzaville. A picture of the 27-year-old witchdoctor Udjani. At this point, most journalists and Congo watchers thought the situation would stabilize. No such luck. The Enyele militia attacked another village close by several weeks later, even though the government had dispatched rapid intervention police to Dongo. The number of refugees having fled across the border to Congo-Brazzaville passed 100,000, an almost Kivutian level of displacement. At this point, the matter became deeply politicized. A hitherto completely unknown politician called Ambroise Lobala Mokobe announced the creation of a new rebellion called « Patriotes Resistants de Dongo, » and released a confused press statement that said that Kabila was a foreigner, propped up by Rwanda, and that MONUC was in complicity with the « mafia-like » regime of Kinshasa. Lobala signed the statement in Dongo, although the village has no internet connection and was completely deserted at the time of his statement. Other groups have also seized on the Dongo fighting, claiming responsibility – Honore Ngbanda, Mobutu’s former security chief, now in exile in France, pounced on the occasion just weeks after he claimed responsibility for a new rebellion in South Kivu (in that case, the rebel leader Dunia handed himself into the Congolese government just days later). Ngbanda’s organization, APARECO, is now a steady stream of propaganda for the new insurgents, claiming they have seized 25,000 tons of ammunition on a barge from the Congolese army (that’s right, 25,000 tons – I guess it was an air craft carrier, not a barge) and provoked « massive desertions » from the government ranks. Check out his website for a laugh. Nonetheless, many Congolese paid attention. Just as with Jean-Pierre Bemba, at least the patriotes resistant were « real Congolese » and not supported by a foreign power. For the inhabitants of Kinshasa, which is linked by the Congo river directly to Equateur, an insurgency there was closer to home in many ways that what is happening in the Kivus. After all, after Bemba’s troops fought it out with Kabila’s presidential guard in Kinshasa in 2007, many Kinois thought that Bemba might launch a new rebellion in Equateur – « he is a real ‘mwana mboka,’ (son of the soil) they said. » Several editorials on Congolese websites (see here for Congoindependant) seemed to approve of the actions in Dongo, although no one really seems to know what is happening (and it seems to have a large local/communal aspect to it). Some websites are even reporting 2 batallions (up to 2,000 troops) from the Rwandan army being deployed there as I write this. What that is supremely unlikely, the government did announce that it was sending 600 troops trained by the Belgian army to enforce law and order. 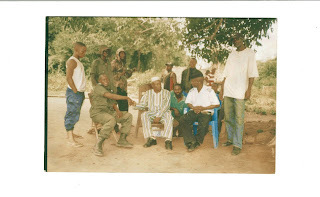 The police chief John Numbi even visited MONUC to ask them to deploy with his police units to Dongo – a surprising move, given that Numbi came under a lot of fire for the massacres of over 160 people in Bas-Congo in 2007 when the police went in to put down similar unrest. MONUC complied, and it is sending 500 to 600 troops to both Dongo and nearby Gemena, quite a few if this is really just a small incident. But the troubles weren’t over – at the end of November, a MONUC helicopter was shot at around Dongo, injuring several people inside. Rumors are abounding that troops (belonging to whom?) are moving on Gemena, a large city, and that the population there is fleeing. This could very well just be « de l’intoxication, » as the government claims, but something appears to be afoot. MONUC chief Alan Doss said at a press conference the other day that « these are not coupe-coupe (bandits). These are brutal weapons they are using. We have several reports that there are people there who know how to use this weapons. » But it’s all incredibly vague. Given previous experience, no insurgency in the Congo can be successful outside of a very narrow area without significant outside support. As opposed to the Kivus and Katanga, where there have been large insurgencies since the 1960s (and even the 1920 and 30s), there is little precedent for that in Equatuer other than Bemba’s MLC rebellion, which at the start received substantial military backing from Uganda. But we shall wait and see….